The European anchovy is a small, gregarious pelagic fish, found throughout the Mediterranean, North Sea and eastern Atlantic. It lives in the open sea at various depths as it can also reach 200 m; in summer, it moves closer to the coasts to lay its eggs. Its maximum length is 20 cm but it is more usually 12-15 cm. It is blue or an intense green on its back with silvery sides and belly. Its body is slender with large eyes and a dorsal fin that reaches halfway down the body. 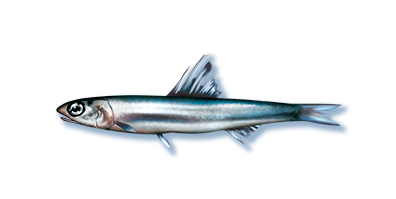 The anchovy may be confused with the sardine but its mouth is different, in the lower part of the head and extends up to the eyes. It feeds on plankton, small crustaceans and mollusc larvae. The anchovy is one of the most important fish species for the Mediterranean Sea and Atlantic Ocean fishing industry. In the Mediterranean area, the most productive basin is the Adriatic Sea with 80% of the Italian catch. It is caught using various methods (bottom trawl and set nets) but mainly with a special purse seine (cianciolo in Italian).